The dagger derives its name from its unique shape, featuring a distinctive and slightly conical shaped hilt with two oval swellings at the guard. The unique shape, featuring a distinctive, slightly conical shaped hilt with two oval swellings at the guard. This particular recreation does not lack that unique form, featuring the same double oval swellings at the tip of the hilt, accented at the top by a brass washer. Save for the brass finding, the hilt is, otherwise, made entirely from carved wood. The dagger blade is hand crafted from fine steel, with a hexagon-shaped cross-section and triangular shaping that draws the dagger down, with straight edges, to a fine point. 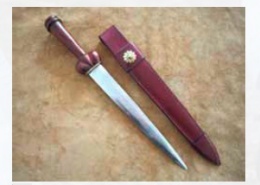 A leather sheath, touched a single brass floral accent has an attached belt loop. popular in Scandinavia, Flanders, England and Scotland between the 13th and 18th centuries, in particular the Tudor period. A large number of such weapons were found aboard the wreck of the 16th century ship the Mary Rose. This page was last modified on 28 September 2013, at 18:36.